January can be a tough month from a few perspectives. It’s difficult to get back into the swing of working, and commuting, after the long Christmas break, and the cold, dark days play havoc with any new year resolutions to move more and consume less. Not to mention, the next pay day seems like an eternity away. It’s no wonder that many of us have already started thinking about our next escape. January is a prime time for holiday bookings, as evidenced by the dominance of adverts promoting carefree cruises and sun kissed resorts. As a result, it’s a strong month for sales in the hospitality sector. But January is an important month for sales productivity on a wider scale. For many B2B organisations it rings in the start of the new financial year, with revised sales targets and a fresh opportunity for the sales team to perform. The top slots are up for grabs on the leaderboard, as sales reps get the opportunity to secure a strong foothold early in the year. In some instances, January can also trigger the last month of the financial year. The sales team has a few final weeks to shake off the excesses of the Christmas season and push hard to close the last deals of the year. The performance of the sales team this month is critical to help bring in a healthy sales annual number for the company. Regardless of a company’s financial calendar, the performance and efficiency of its sales reps is key in boosting sales performance and driving revenue for the business. Sales productivity is measured by the rate a rep increases revenue for a company. The more productive a rep is, the better they are at selling and establishing lasting relationships with clients and contacts. However, according to CSO Insights salespeople are spending just 35.9% of their time selling, with the rest of their week consumed by other tasks. It’s no surprise then that sales productivity is the number 1 challenge for almost 65% of B2B organisations, according to research from The Bridge Group. It’s unlikely, and unadvisable, to make sudden changes in sales processes, especially if January is the last month of the financial year, but a quick review may highlight some tips to help drive improved effectiveness and efficiency, and boost sales productivity for the team. It takes an average of 23 minutes and 15 seconds to get back to a task when switching between activities. Minimise time wasted by batching tasks together and not moving on to the next until everything in the current grouping is completed. Setting aside time for calling, emailing, researching and reporting etc., and sticking to this sequence will prove to be more efficient than doing everything in a one off-linear sequence. Reps can make the most of their day by using the ideal time to call prospects and use non-ideal time to focus on other tasks such as research, follow up emails etc. The optimum call time or day may differ according to the region or sector, which will be determined by appropriate research of a prospect account prior to making contact. Existing customers can be a rich source of prospects for sales reps. Companies that spend time nurturing these relationships, can ensure customer satisfaction and speed up the sales process in the meantime. Set up a referral incentive programme to encourage introductions from existing customers. A simple scheme that can help bring in new prospects who are more likely to be engaged through a third-party endorsement. The process also helps validate the value of existing customers and strengthen those important relationships. Most people don’t buy on the first point of contact, or even on the first or second follow up. Setting reminders or automating a series of follow up activities increases the chances of success for a sales rep.
CRM and Marketing Automation tools facilitate in managing the process and help to keep a healthy cadence on outreach campaigns to prospects to support the direct sales calls and emails. Poor communication between sales and marketing teams is a common occurrence in many organisations. Often, as a result they end up duplicating efforts and missing opportunities. Having regular sessions for both teams offers an opportunity to share information and work together on requirements for messaging, content and pitches. It will help improve collaboration and create more, better qualified leads for the sales team to close. Sales reps are at the coalface of the business and can share valuable insight from their vantage point. Encourage feedback from reps at regular team and one-to-one meetings to identify opportunities to improve processes which support them to achieve their targets. 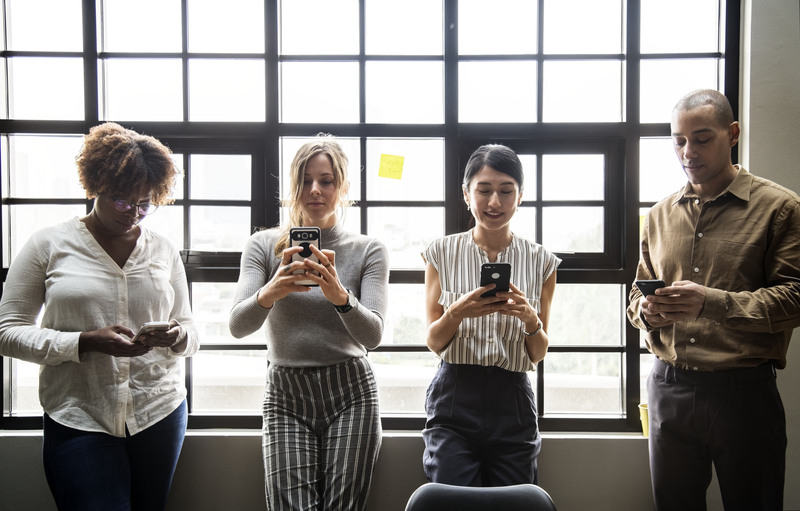 Seeing that their opinions are valued and appreciated also goes a long way to helping with rep motivation and boosting the overall sales productivity of the team. No matter what results the business achieved last year, we could all do with a little extra in the pipeline. By establishing an agile sales process that’s streamlined and free of road-blockers, we can help our sales team increase their day-to-day productivity so they’re able to reach more prospects, convert more leads and add even more value to the business. And that, is a very good way to start the new year. Your CRM system is first and foremost a tool to make your sales reps more efficient, more productive and in turn, more successful. So why aren’t you seeing the expected ROI? It may be down to the way your sales team is using the platform. 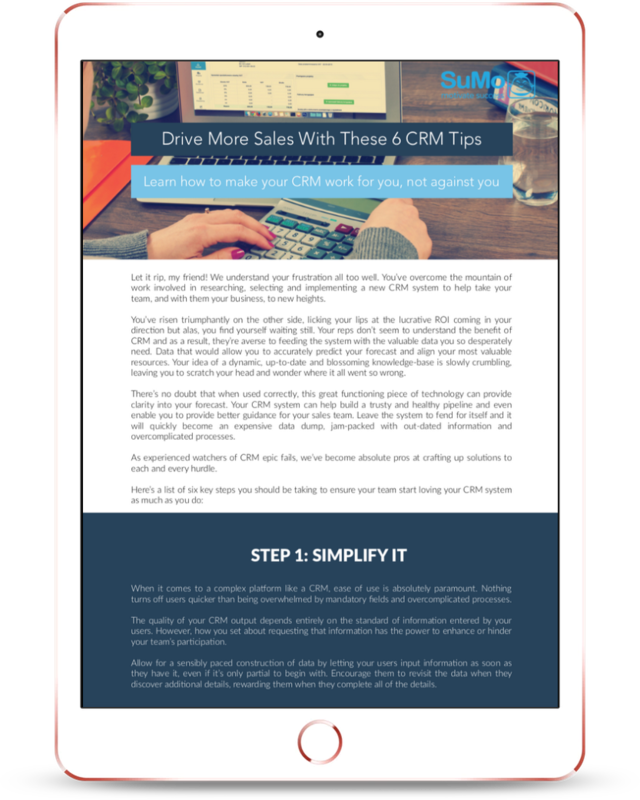 In this paper we give you our 6 top tips to getting the most out of your CRM tool.